All New Pig Pallets and Decks come with our exclusive Quality Advantage. 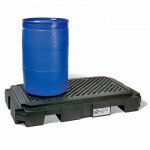 PIG Heavy-Duty Poly Spill Containment Pallets are tested to be the toughest pallets on the market. They won't blow, buckle or break at maximum load capacity. An innovative design transfers weight to load bearing channels to maximise capacity. They are easy to load with a low-profile design. If the heavy strength is not required, New Pig's Standard Duty Pallets are long-time customer favourites.